Description: Burlington Northern Railroad SW1500 28 at Galesburg, Illinois on an unknown day in November 1981, Kodachrome by Chuck Zeiler. The coaling tower for CB&Q steam locomotives is in the background, soon to be taken out. Description: Colorado & Southern caboose 10642 at Cicero, Illinois on an unknown day in December 1981, Kodachrome by Chuck Zeiler. 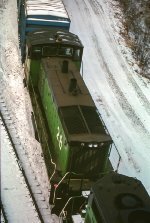 This caboose was built by International Car Company in April 1972 and delivered in Cascade Green. Description: BN SW7 124 at Cicero, Illinois on February 26, 1984, photo by Chuck Zeiler. Number 124 was built in May 1950 as CB&Q SW7 9258 (c/n 8502) on EMD Order E1196, became BN 124 sometime after March 2, 1970, and was retired by the BN in July 1985. Description: GP20 2066, GP15-1 1377, SW1500 25, SW1500 28 at BN's Lindenwood Yard in St. Louis, MO. Taken in the summer of 1985. Description: BN 1409, EMD GP7 rebuild, now GP10, leading SW1500 BN 28 past Hill Yard in Aurora Illinois. Description: Working at Fargo Yard. Year correct, date arbitrary.